Middlesex University photography student Tereza Cervenova is celebrating after winning a D&AD Yellow Pencil New Blood award for her photograph ‘Family Matters’ of her younger brother and sister. 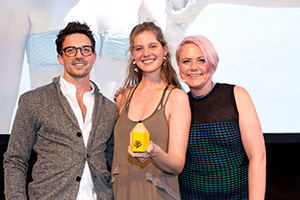 The final year student was awarded the respected industry prize at a ceremony in Brick Lane last week. The photo was selected by an impressive industry panel as winner of the category and the Yellow Pencil award. Tereza submitted the photo taken on a family holiday in Greece in 2013 in response to the brief set by Nokia to 'Revisit the idea of the 'decisive moment'. Unusually Tereza had two photos shortlisted in the category; 'Family Matters' and one of her brother titled 'Adam'. Both photos were taken from her Middlesex University final year photography project. The talented student, who will graduate next week, is no stranger to national success. Tereza was selected to have her work exhibited in the Taylor Wessing Photographic Portrait Prize at the National Portrait Gallery last year. She was also one of the five winning photographers for the first '5 Under 30 Young Photographers exhibition at the Daniel Blau Gallery in London. Middlesex University student Tereza Cervenova (23) said: "The 'Family Matters' image is of my brother grabbing my sister at the beach. The relationship between my siblings and I has been a great shaping force of our youth. On one hand those 'deadly serious' rows over nothing, but on the other bonding giggles on the back seat of the car, have been the decisive moments of our growing up." "This image, together with many from my final year project, are mainly of my friends and family. But the moments that they capture could be from anyone's life. I hope viewers can make a connection to the images and interpret them in their own ways," added Tereza. "It feels brilliant to have been selected. The awards evening was great. I attended with my Middlesex tutors and it felt like I was there with my family," commented Tereza.